Many families has myths, legends and family traditions where rumors are both internal and external. It has also my family. In about 1996 I became aware of some sort of rumors from a friend in my class. I did not think of it much until I heard of the rumors again when I was a student in Uddevalla in 2001, including the ironical text "Sir Brage" at lower left corner of a lecture slide, that led to that I became interested in heraldry. But I did now know exactly what the rumor was until several years after that the tree was completed in 2007. Legend speaks of Royal House of Bernadotte, and thus Vasa and other houses, at both my mothers fathers side, where rumors speaks of King Gustav VI who stopped drinking alcohol the year my mothers father was born, and at my fathers mothers side, where rumors speeks of a descendant of King Oskar II (blixtrar den ene så åskar den andre). There are some visual similarities as well towards different Bernadotte members, particullary towards me and "V Gurra" (Gustav V) but there are also other cases if one knows how for example Folke Bernadotte and Oskar II looked like. There are also some sorts of rumors about some other house at my fathers fathers side. Legend also speeks of Vasa blood from for example ancient noble houses like Trolle and Uggla hidden at varios parts of my family tree. 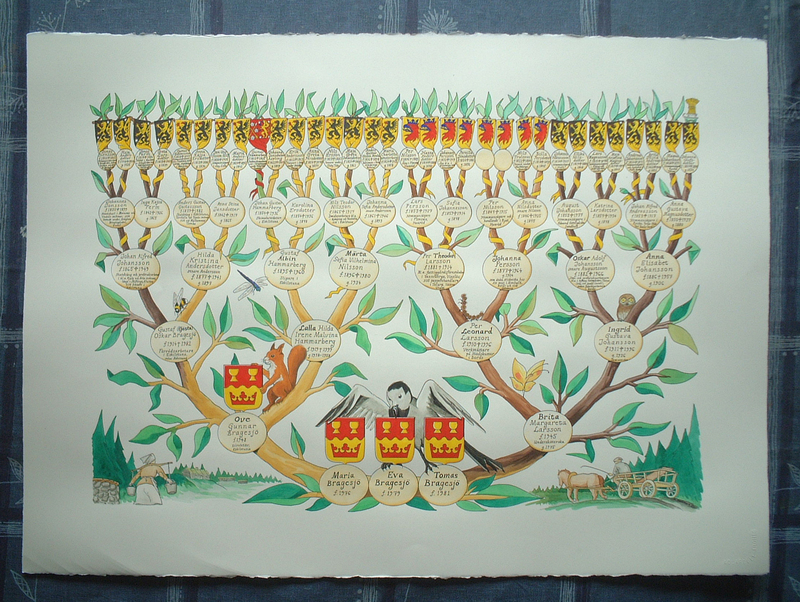 Note the marks with yellow where names does not match Swedish naming traditions. Also note the red thread on the green with two shields at the same position. Also note the supporter holding the shield. Only royal and a few high nobilitys coat of arms uses supporters. I belive I know why it is a squirrel and it is linked to a riddle from my fathers mothers mother about Frank Fredrik Friis and the old danish noble house Friis coat of arms has squirrels. The shields on my family tree marks where the oldest persons listed at my family tree lived in. At my fathers fathers side Västergötland (Skaraborgs län) then comes Södermanland. At my fathers mothers side Närke and Östergötland at the same shield and after that mainly Södermanland and also Västergötland at one position. At my mothers fathers side Skåne and at my mothers mothers side Västergötland (Älvsborgs län). Älvsborgs län and Skaraborgs län combined was the core lands of the old kingdom of Västergötland. The kings names are little known but it is still documented that Västergötland had its own kings. Svealand and Västergötland and Östergötland did at some point form a defence allians that became the kingdom of Sweden. The Swedish kings titles was "Sveriges, Götes and Venders konung" until 1973 when it becamed simply "Sveriges konung". Before Napoleon wars Finland was also part of the title, often as "Storfurste av Finland", and during Swedish-Norwegian Union the title was "Sveriges, Norges, Götes och Venders konung". Per Anderssons excellent book project about Vasa decendens covers some 250 000 Vasa decendens. Its however still far from complete but it is impossible to cover the missing persons. It does not cover Vasa from none Swedish lines nor illegitimate ways unless they where ennobled. So Swedes (or any other nationality) with a tree similar to mine are not mentioned. The illegimate lines can be both from kings as well as from nobles or commoners. For example before he became king, Karl X Gustaf of House Pfalz got several illegitimate childs on Öland. And both of the brothers Kron-Kalle (Karl XV) and Oskar II has rumors about 100s of illegitimate childs, it is still unclear exactly what rumors that are true since the Royal Court of Sweden refuses DNA tests. The brothers mother are also one example of one none Swedish Vasa line that would have been unmentioned if she had married someone else who later moved to Sweden even if was legit decendens.